When the terrain gets tough, you can depend on the GPSMAP 62st handheld navigator to guide you through, with 3-axis tilt-compensated compass, barometric altimeter and preloaded European 1:100k scale recreational map. Inspired by the powerful GPSMAP 60 series, this rugged and waterproof GPS combines high-precision accuracy with high functionality to brave the demands of any terrain you dare to tackle – wherever the adventure, whatever the activity. GPSMAP 62st comes with built-in European 1:100k recreational map with street-level detail and a worldwide basemap with shaded relief, ideal tools for climbing or hiking. Map detail includes forests, roads, terrain contours, elevation information and points of interest. It has a 2.6-inch sunlight-readable colour screen and supports photo navigation, so you can download geotagged pictures from the Internet and navigate to them. GPSMAP 62st has a built-in 3-axis tilt-compensated electronic compass, which helps you get your orientation and points you towards your destination even when you’re standing still, without holding it level. Its barometric altimeter tracks changes in pressure to pinpoint your precise altitude. View elevation and profile on the altimeter screen and you can even plot barometric pressure over time to keep an eye on changing weather conditions. 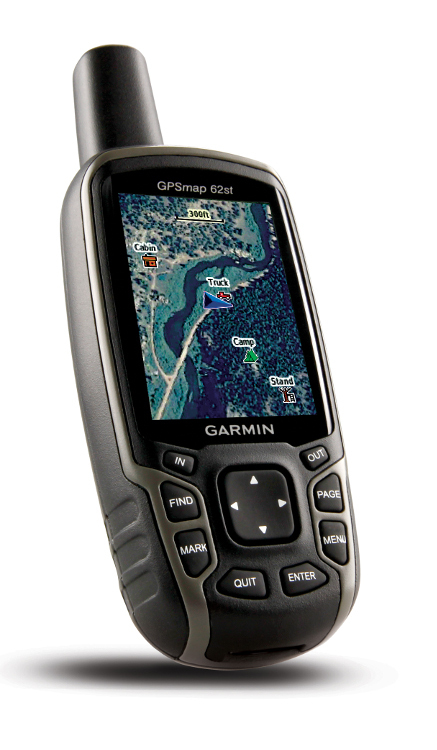 With GPSMAP 62st you can share your waypoints, tracks, routes and geocaches wirelessly with other compatible Garmin GPS handhelds. So now your friends can also enjoy your favourite hike or cache — simply press “send” to transfer your information to similar units, and let the games begin. With a quad helix antenna and high-sensitivity, WAAS-enabled GPS receiver with HotFix® satellite prediction, GPSMAP 62st has unparalleled reception to locate your position quickly and precisely and maintains its GPS location even in heavy cover and deep valleys. The advantage is clear — whether you’re in deep woods or just near tall buildings and trees, you can count on GPSMAP 62st to help you find your way when you need it the most. With space to store up to 2000 waypoints and 200 routes, GPSMAP 62st’s detailed route planning and tracking helps you navigate from point-to-point and keep track of your journey as you go. As you navigate to a destination on an active track, you can view upcoming elevation changes together with waypoints and key stages along the route for a clear picture of the journey ahead. And with customisable display, you can tailor GPSMAP 62st’s dashboard to show you the details you need on your adventure. Adding more maps is easy with Garmin's wide array of detailed topographic, marine and road maps. You can download regions of our Garmin GB Discoverer™ mapping for OS Explorer (1:25k) and OS Landranger (1:50k) detail and hit the trail. The traditional look and feel of the Ordnance Survey map detail complements Garmin’s dynamic search capabilities. Use GPSMAP 62st to search, select and navigate to points of interest and street addresses and follow the route on foot, in the car or by bike with an Ordnance Survey backdrop. AddBlueChart® g2 downloads for a great day on the water or City Navigator NT® map data for turn-by-turn routing on roads (see maps tab for compatible maps). GPSMAP 62st also supports BirdsEye™ Satellite Imagery (subscription required), which lets you download satellite images to your device and integrate them with your maps. See the terrain in terrific clarity and high-resolution detail with satellite and aerial imagery on your GPSMAP® 62st. BirdsEye™ works with your BaseCamp™ planning software, onboard maps and points of interest to add real-world images of buildings, roads, trails, mountains and other land features. In addition, the 62st is compatible with Custom Maps, free software that transforms paper and electronic maps into downloadable maps for your device. Put your favourite paper or digital maps on GPSMAP® 62st by converting details, labels and landmarks from other maps and informal plans like ski piste routes, mountain bike trails or charity treks into tailored content that’s ready to navigate. GPSMAP 62st supports geocaching GPX files for downloading geocaches and details straight to your unit. By going paperless, you're not only helping the environment but saving time you would otherwise waste manually entering cache details before you set off. GPSMAP 62st stores and displays key information, including location, terrain, difficulty, hints and descriptions, which means no more manually entering coordinates or paper print outs! Simply upload the GPX file to your unit and start hunting for caches. Slim and lightweight, 62st is the perfect companion for all your outdoor pursuits.